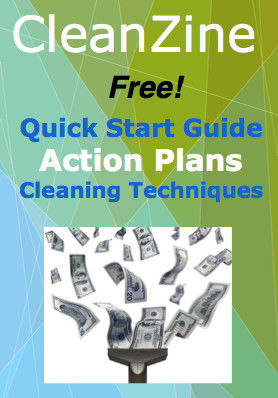 When starting up a cleaning company you will want to learn as much has you can in advance. One of the biggest mistakes a cleaning service start up makes is that they try to figure it out on the job. Sometimes this works out, but most of the time you make a fatal error that is hard to recover from. Many people think the most important issue is getting the contracts and being bonded. These are actually 2 of the least important issues when starting up. Cleaning business contracts are rarely used in residential cleaning and in commercial cleaning, they are easy to obtain. Once you do you need to customize the form to the specifics of your companies services and requirements. So there is no magic form that will guarantee the success of your new business. It is good to be bonded if you are going to be doing large commercial jobs. It is not really necessary for smaller office cleaning or home cleaning. You will want to be insured and licensed – if required – but that is easy enough to do. The main concern you need to have with your cleaning company is how to get the cleaning jobs and to get them at a rate that will sustain your enthusiasm and motivation. You need to have some momentum in order for it to launch properly. Your start up needs to be designed before you start, you will achieve best results this way. Another newbie mistake is thinking you can just put and ad in the newspaper and people will start calling you. They will, in very small numbers over long periods of time and you will get every situation under the sun. This will cost you a significant amount of money, compared to direct targeted marketing. And you do not want every possible cleaning job, you want the better ones that are the best fit for you. This is vitally important. You only need a couple dozen clients, so there are plenty of perfect fits out there for you! Yet another mistake is thinking you can just put up a DIY free website and it will suffice. It will be on the internet but it will do next to nothing. You need an optimized website design that is going to get seen online in various ways. This is a special skill that can cost a lot of money to get right. Doing everything on the cheap usually means getting bad clients with little money and your business limps along as a result. When starting up a cleaning company, educate yourself, plan well and have a step-by-step strategy to guarantee your long term success. It is an excellent way to make a living and noble one at that.